1 of 3 Pour 3 cups water into slow-cooker insert. Place a slow-cooker liner into slow cooker (on top of water). 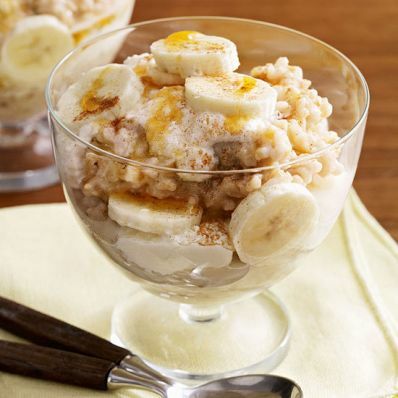 Combine half-and-half, 5 1/2 cups water, the oats and salt into slow cooker liner. 2 of 3 Cover and slow cook on LOW for 8 hours. Uncover and stir in 6 tbsp of the maple syrup. Blend ricotta and remaining 1 tbsp maple syrup. 3 of 3 Begin layering: Spoon 1/2 cup oatmeal into 6 cups or bowls. Top each with a heaping tbsp ricotta mixture. Peel and slice bananas. Spread about 4 banana slices onto each serving. Repeat layering with oatmeal, ricotta and banana slices. Drizzle each serving with a little maple syrup and sprinkle with pumpkin pie spice.